Dip the top of shot glasses in melted butterscotch chips then into carrot cake sprinkles to create a rim around each shot glass. In a blender, whip together the espresso, Irish cream, and maple syrup. Use hot espresso if using a standard blender, or beat cool mixture in an industrial-sized blender until warm. Add pumpkin pie spice to taste - adding, blending and tasting until desired spiciness is achieved. Pour drinks into shot glasses. Garnish with teeny paper straws, if desired. Serve immediately and enjoy! 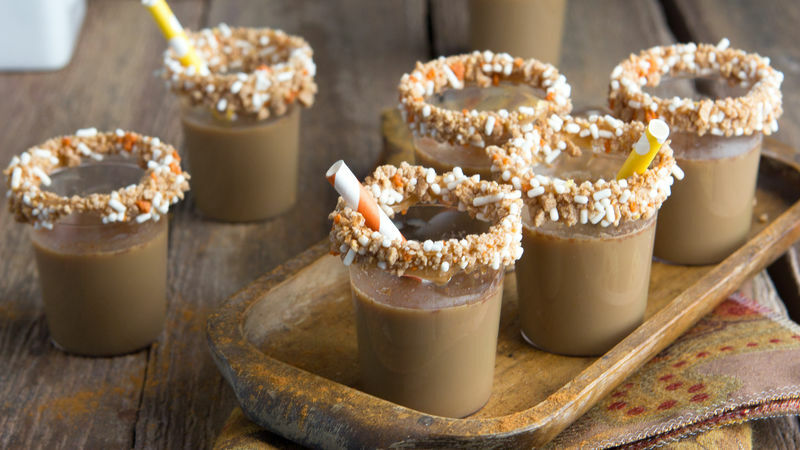 Perfect for the holidays, these little shots rock all the comfort flavors of the season with Irish cream, maple, coffee and spice. Pumpkin spice is great...but for the trendy flavor hipsters among us, it's time to tuck yourself into maple spice. This glorious party drink is about to make you a believer. Is it just me, or is any ingredient lineup with Bailey's a shoe-in for life? Put this on your party menu stat – you're gonna want a vat of it. ...and spiced streuselly sprinkles. If you can't find these brilliant Betty Crocker carrot cake sprinkles, you can also rim your shot glasses with chocolate sprinkles. ...all you gotta do is whip all of the drink stuff together and start pouring. Then add teeny little paper straws and start sipping.